Truffle Lodge Kitty Care is a beautiful, purpose built cat hotel (Boarding Cattery) situated just 2k from Kinsale, Co. Cork, in an idyllic country setting. 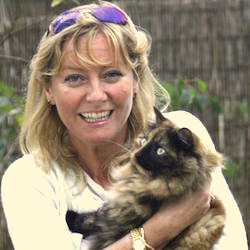 Imelda Kelly, who has had a life-long love of cats, is the proprietor of the business. We have 10 luxurious chalets on site. Each chalet can accommodate up to 2 kitties from the same household. There is a cozy heated bedroom and a large exercise area with plenty of toys for entertainment. Our chalets are located in a beautiful countryside setting, giving the kitties lots of fresh air. Each chalet is totally secure, immaculately clean and a haven for chilling out. Your kitty will have a great holiday! We serve Royal Canin dry and wet food each morning and for dinner which the kitties absolutely love! Each chalet has plush and cozy beds and hideaways. We use natural straw pellets for kitty litter. Daily playtime and interaction with Imelda, if your kitty so chooses. Sometimes kitty likes to be alone – just like Greta Garbo! The cat hotel (Boarding Cattery) is in very close proximity to our house, so your kitty is continuously monitored. Each chalet has a “sneeze barrier” so there is no risk that kitty will pick up any undesirable bug while in residence. On call 24-hour veterinary service is available. We use Feliway Spray in the hotel to help transition more anxious guests into their chalets. Outside of our normal opening times, we will gladly show kitty parents around the hotel and you can be 100% confident that this is the right cat hotel (Boarding Cattery) for your pet. Arrangements can also be made for the collection and return of your pet(s). We use Safe-4-Vet approved disinfectant.